Several years ago, Bill Barrow purchased a property on agricultural marshland near Amherst. Here, the avid outdoorsman added a small camp; a wildnerness getaway where he could enjoy nature during his retirement years. Barrow saw potential to provide more wildlife habitat by restoring a 22-acre (9-hectare) marsh on his property, but there was a problem. Since his project consisted of protected agricultural land—which is highly regulated under the Agricultural Marshland Conservation Act— he was not permitted to restore the wetland. Barrow persevered. 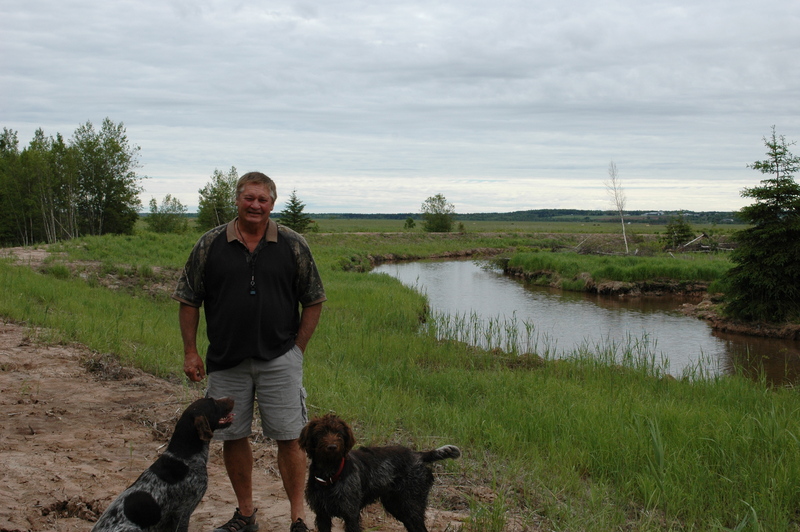 After several years of making applications and working with DUC through municipal and provincial approvals, his wetland restoration project got the green light. From December 2016 to February 2017, DUC worked to create the freshwater wetland by constructing dykes to capture water that was being released by ditches. Now, the restored wetland will function as improved habitat and will also slowly release water during spring flood events, decreasing the duration of flooding downstream. Barrow has plans to invite community groups and schools to visit the wetland once it’s established. Its first time in a decade that DUC has created a project like this on Nova Scotia dykeland, and it’s a welcome addition to DUC’s existing projects in the area. Thanks to the efforts of Bill, who fostered positive relationships along the way, there are opportunities for similar restoration projects in the province on non-productive agriculture lands.